Thrive Chopped Spinach offers many health benefits. In one can of Thrive Spinach, you will find 23 servings of rich green spinach that helps prevent cancer and improves the strength of your heart, eyes, and brain. Try using Thrive Spinach in sandwiches, salads, pasta, or even dips. 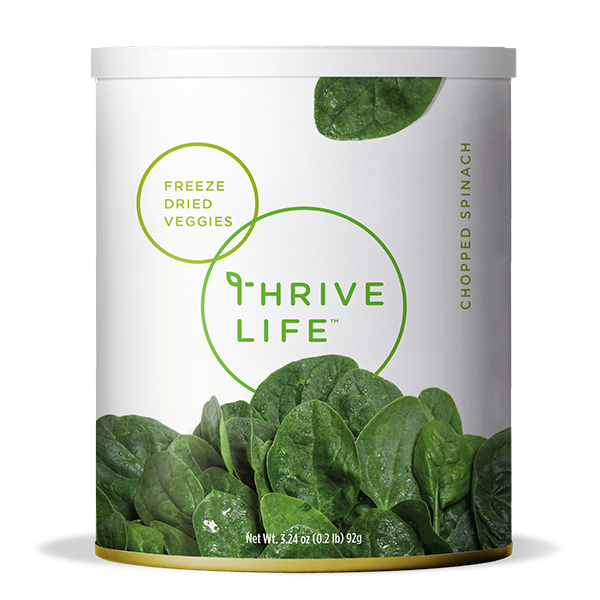 Like all Thrive freeze-dried products, our spinach has an extended shelf life so you will able to use it for years to come. Add 1 cup spinach to 1/3 cup water and soak for 5 minutes until tender. Drain any excess water. Use it in soups or spinach artichoke dip. It’s easy to slip it into spaghetti sauce to add a hidden serving of veggies. Crumble it up and sprinkle it over main dishes as a garnish, or add it to your smoothies for a healthy boost.